Whale ALERT - West Coast - Why are the whales there? You are here: Home » Learn » Why are the whales there? Why are the whales there? The west coast sanctuaries, although unique in their own way, all host an abundance of marine life and upwelling plays an important role in creating such a diverse assemblage. Upwelling occurs when winds from the north travel down the coast, pushing warmer surface waters offshore and drawing up cool, nutrient rich waters from below to take its place. This creates phytoplankton blooms, the base of a rich food web. Food is plentiful for whales as they stop over during their long migrations, and when upwelling conditions are right, some find it sufficient to stay year-round. At the Olympic Coast National Marine Sanctuary, winds favorable to upwelling are a bit weaker than in other areas along the coast. Regardless of this, nutrient-rich water drawn up from upwelling is enhanced by the deep water canyons that are present nearshore and thus, creating a diverse food web. There are more species of kelp and marine mammals that live here than anywhere else in the world. In contrast, one of the strongest regions of upwelling occurs along the central California coast at Cordell Bank and the Greater Farallones National Marine Sanctuaries. Upwelling here allows these waters to support one of the most productive food webs in all the oceans. 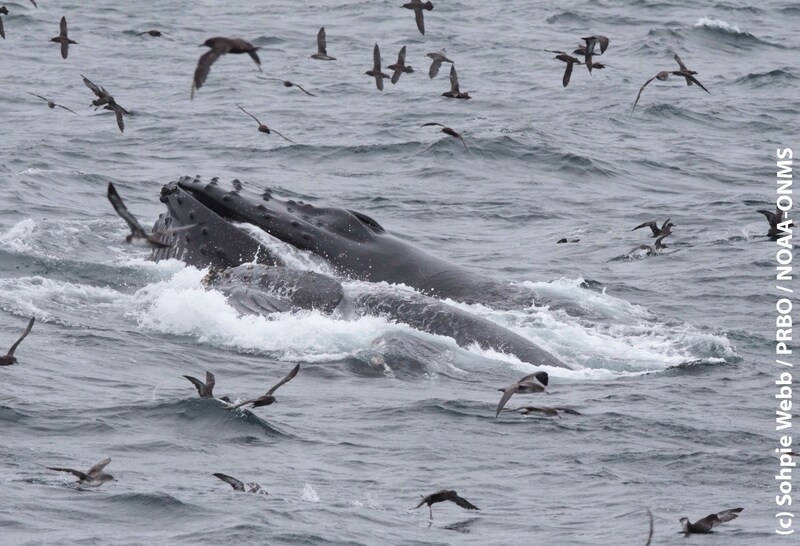 The Monterey Bay National Marine Sanctuary spans 300 miles of coastline. Upwelling centers are located to the north and south of Monterey Bay. This spatial variability in upwelling and the variation in upwelling over time likely play an important role in the productivity of these waters. The Channel Islands National Marine Sanctuary is unique along the coast as it is a transition zone between temperate and subtropical regions. The western islands of the Channel Islands chain are influenced by upwelling that occurs to the north at Pt. Conception each spring and summer. Meanwhile, the eastern islands are surrounded by warmer waters that have been transported from Baja California. These warmer waters host subtropical species, making the marine life at these islands quite diverse.